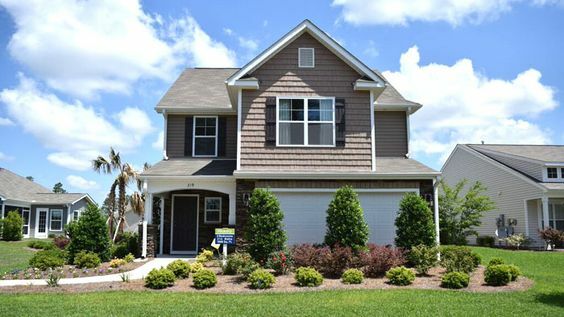 If you're looking for a fabulous new home in the Carolina Forest area, Summerlyn is a definite must-see. Even though it's one of the newest neighborhoods, it's already earned a reputation for attracting home buyers with an eye for quality and who demand value. Summerlyn delivers on both counts. Read more about Summerlyn real estate. The affordability of Summerlyn has not been compromised. It offers 1- and 2-story floor plans. Its 2-bedroom homes with no garage start at around 1,000 heated square feet. If you want something bigger, the 3-bedroom, 2,000 square foot homes also have a double garage. Need even more space? Summerlyn offers 4-bedroom homes as well. There are plenty of options to choose from exteriors including vinyl, stone accents, and stucco. Some plans allow for screened porches, sunrooms, bay windows and bonus rooms. And all homes have natural gas. The neighborhood amenities include a community clubhouse, swimming pool and home sites with beautiful water views. Summerlyn HOA fees are reasonable and cover the community clubhouse and pool cost, trash pick-up and street lighting. Located literally across the street from the new Horry County Recreation Center, Carolina Forest Public Library, and Palmetto Adventure Land playground, Summerlyn is a parent's dream. Plenty of activities for the kids and you don't have to drive all over town. Better still, the community within award-winning Carolina Forest school district. The neighborhood is 8-10 minutes from Myrtle Beach's golden mile beachfront. The neighborhood is minutes to Highways 17, 31 and 501 with easy access to all Grand Strand attractions including restaurants, shopping and more. For that to-do list, there are banks, hospitals, retail stores and golf courses nearby.